When I was pregnant, Derek and I would have countless conversations about our future as a family of three. And one of the things I found myself talking about a lot was feeding our little one. I had this vision of raising a little foodie! But let me tell you the reality doesn't exactly look like my picture perfect vision! Family dinners these days are loud and messy. They are challenging and fun, and most nights more food ends up on the floor then in Theo's mouth! But this is the season of life we are in and I am embracing it, mess and all. Don't get me wrong Theo is a good little eater, but we still have our less than stellar days (cue he doesn't like what I made, or he isn't in the mood to eat). It's the less than stellar days that remind me to go with the flow, and enjoy the process of teaching him how to eat and enjoy food. 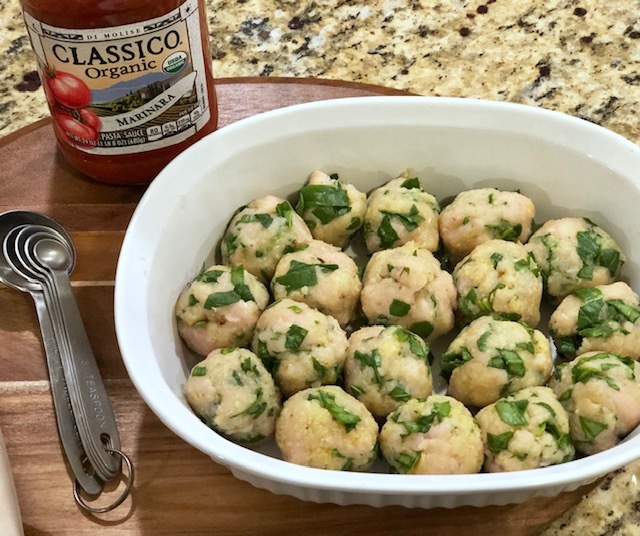 I have found that simple meals work best for this season of life which is why I am excited to share the recipe for these Chicken and Spinach Meatballs with you! 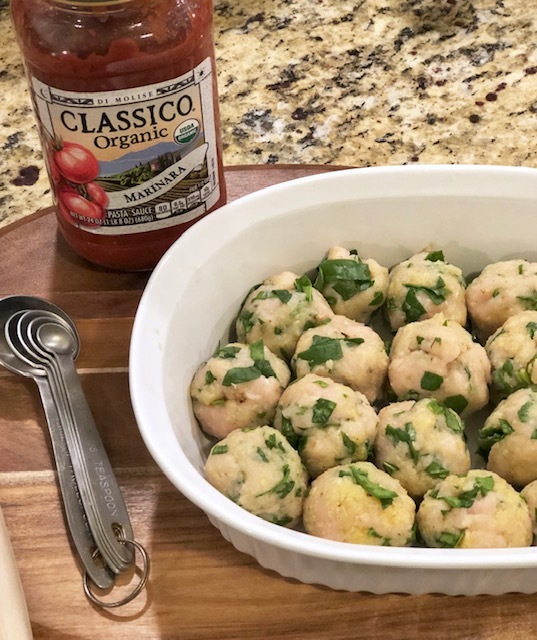 Theo gobbled these meatballs right up which made for one happy mama! I hope you enjoy them as much as we did! And P.S I plan on sharing another post on our approach to solids with Theo at a later date, more to come! 1- In a medium bowl combine the ground chicken, spinach, egg, bread crumbs and seasoning. 2- Mix everything by hand until combined. 3- Roll chicken mixture into medium size balls and place in a casserole dish that has been greased. 4- Bake for 20-25 min in 350 degree oven until cooked through. Serve with warmed marinara sauce for dipping, a simple green salad or your favorite roasted/steamed vegetable (Broccoli is a fav in our house)!